When Jason Corliss and his family-owned race team pulled into Thunder Road Speedbowl (VT) for the first time in 2004, they did so with a Street Stock being towed into the pit area on a tow dolly behind a pickup truck. On Sunday afternoon, nearly 10 years later, things ended up coming full-circle for Corliss when he rolled into victory lane in the track’s premier division, the Late Models, at the conclusion of one of the most prestigious events held at the track each year. 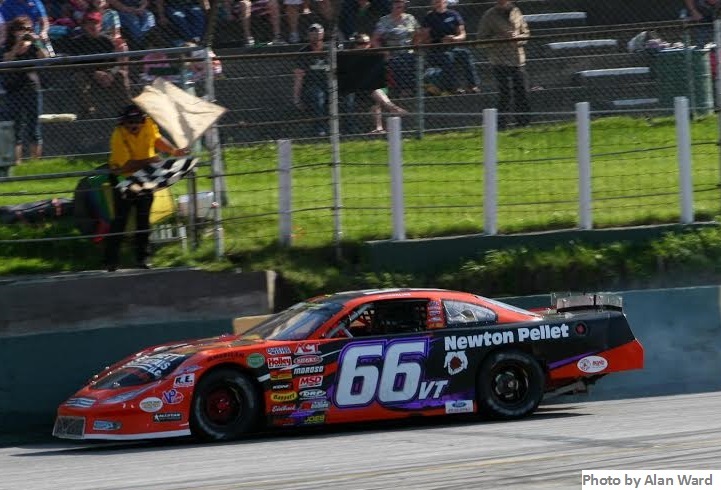 The 25-year-old driver, who resides in Barre, Vermont, used a last lap, last turn pass on two-time Thunder Road “King of the Road," Nick Sweet, to carve his name into the granite monument as the winner of the 52nd running of the Memorial Day Classic. Corliss’ win on Sunday was a prime example of a driver climbing through the ranks at Thunder Road and making it in the tracks premier division. The Barre, Vermont driver got his start in the tracks Street Stock division before progressing to Thunder Road’s intermediate division, the Tiger Sportsman, and eventually making his first start in a Late Model at the start of the 2013 racing season. Throughout the transition from division to division, things weren’t always easy for Corliss. Due to being an underfunded race team, Corliss didn’t always have the best equipment to work with. On Tuesday, Thunder Road owner Tom Curley referred to Corliss’ first Tiger Sportsman car as “a 20th-place car pulled out of a hay field." After recording respectable finishes in the Tiger Sportsman division, Corliss was offered a ride in the tracks premier Late Model division. Like with his Tiger Sportsman, when he first started racing that type of car, the equipment and resources made available to him may not have been up to par with the competition but he continued to stay positive and make the best out of the opportunity. Still, with mediocre equipment at best, Corliss was able to record respectable finishes. That caught the eye of sponsors that offered to bring money on board. It even caught the eye other race teams who were watching Corliss record solid finishes with limited resources. One of those people that Corliss caught the eye of was a crew member for eight-time American-Canadian Tour champion Brian Hoar. Like he had throughout his racing career, Corliss and his team continued to stay positive, work hard, and improve each and every week. 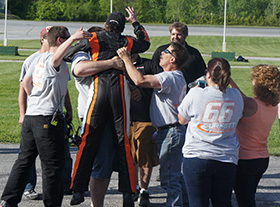 All the hard work throughout the years finally paid off on Sunday when Corliss proved to all of the current Street Stock and Tiger Sportsman drivers that it is possible to reach your dreams through hard work and dedication. “I heard today in the office, all the staff was telling me that everybody watching the race was rooting for him,” said Curley. “It wasn’t because they don’t like Nick Sweet because they do. Every single one of those teams, all of those Street Stocks and all of those Tigers, were yelling at the end because for them he is the example. He defined for them that everybody has a shot if it’s an equal playing field because he was one of them. To many in attendance at Thunder Road on Sunday afternoon, Corliss’ win was unexpected. With heavy hitters and defending champions like Nick Sweet and Derrick O’Donnell in the field, the sophomore Late Model driver was considered an underdog by most people. One of those people that didn’t consider Corliss an underdog was Tom Curley. Curley, who has watched Corliss come up through the ranks at the track he owns, always knew that Corliss had a lot of talent behind the wheel and even went as far as to tell him on Sunday morning that he thought he could win the race. 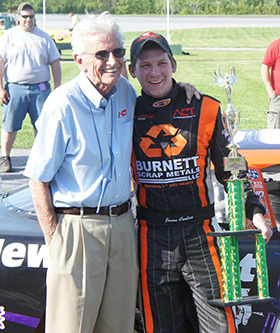 Following the win, Corliss’ style was compared by many people, including Tom Curley, to Nick Sweet’s - the guy he beat by .008 seconds to win his first career Late Model race. Both drivers reside in the track's hometown of Barre, Vermont, both made their way through the Thunder Road ranks starting in the Street Stocks, and both exhibit respectable driving styles on the race track. Corliss said following the race that just having his name in the same sentence as Sweet’s is an honor. “I have a ton of respect for Nick Sweet. He is a fantastic person and a fantastic race car driver. To be able to be compared to Nick, I feel very fortunate. To have Tom Curley’s blessing and for him to be the one to compare me to Nick Sweet is very special. Now sitting at the top of the point standings after one race, Corliss hopes to use his win on Sunday as a momentum builder for the rest of the season. During the past two seasons at Thunder Road, the winner of the Memorial Day Classic has gone on to be crowned “King of the Road." Corliss has high hopes of keeping that streak alive going into the 53rd running of the event. “This is definitely a huge, huge step forward for our program,” Corliss said on Sunday. “It gives us the confidence to know that we can do this. We have the team, we have the car, and if we have all that I can drive it. It’s a hell of a start for us. That was our plan at the beginning of the year, to battle for the King of the Road.